Privado, casa de dos pisos ubicada en el lago Washington. Arriba tiene una cocina recién remodelada, baño completo, dormitorio principal y dormitorio de repuesto. También hay un comedor y sala de estar. En la planta baja tiene sala de estar, cocina nueva, lavadero, dormitorio y medio baño. Hay un muelle privado perfecto para la pesca o ver el lago. Casa también tiene una barbacoa y fogata. También hay un aparcamiento privado para hasta 8 coches. El baño de arriba tiene un lavabo, inodoro y ducha / bañera. El baño de la planta baja es solo un lavabo e inodoro. This property is in need if a major update. The only thing it had going is the view of the lake. The downstairs kitchen is nice but all the cooking supplies are in the upstairs kitchen. The bed in the 2nd bedroom is very comfortable, dont plan to sleep comfortable. The carpet is very old throughout house but the master bedroom carpet is really bad. I would not walk barefoot on it. The stairs down to the house are poorly lite and steep and the address is not marked very well. The owner was very nice, but she needs to put some money into this property and I think it could be awesome. We fell in love with the house, and the lovely furnishings. We especially loved that there were so many comfortable places to sit comfortably. We sat everynight on the porch, enjoying the evenings, and again early each morning. Heavenly, no bugs! It was great to have coffee makings and bottled water, and we liked having condiments in the frig, even though we never actually cooked at home. The major obstical for us was the stairs leading to the house. We are all retired, and probably would have still rented your place if you had warned us, but if would really have been helpful to know in advance, because we would have packed our bags differently so we didn't have to take everything down the hill at once. The other most serious problem was the bed frame downstairs. It has VERY sharp corners, and the floor to the room is uneven, so when I was up in the night to use the bathroom, I came back in the dark, tripped, and the corner caused a huge gouge in my leg. It bled profusely, and I stat up a long time hoping to stop the blood flow. I cleaned the sheets with hydrogen peroxine, and washed them, and think it all came out, but I suggest you find a way to prevent this from happening again to your family or guests. I could tell you are still finishing the basement, and expect you will be adding a mirror and hand towels and towel racks to the room. We also rent a unit through VRBO, and know we are constantly trying to figure out what is really important to guests. The stairs to the basement are also very steep, but I don't have a suggestion about how to fix that. In the dark, walking down the long trail, we noticated there are places that are not well lit, and this could cause accidents. Also, the maps you sent were a great help, but we needed a few more details about the final location of your house, and exactly where to park. We were clueless that we had to climb down 52+ steps, so we were confused for a while. Thank you for providing us such a lovely place to stay. We loved sitting on the deck and taking in the views. Based on what we paid, I thought it the interior was good enough, but it’s outdated and tired. Really enjoyed the quiet lake views! Huge amazing porch with a view!!! Be warned the house is a bit hard to find as you need to go down a steep staircase to access it (could use better house number signage from the street). But once you are down there, you are in paradise! I rented the house for my parents to stay at while in town and we spent the entire time on the back porch. 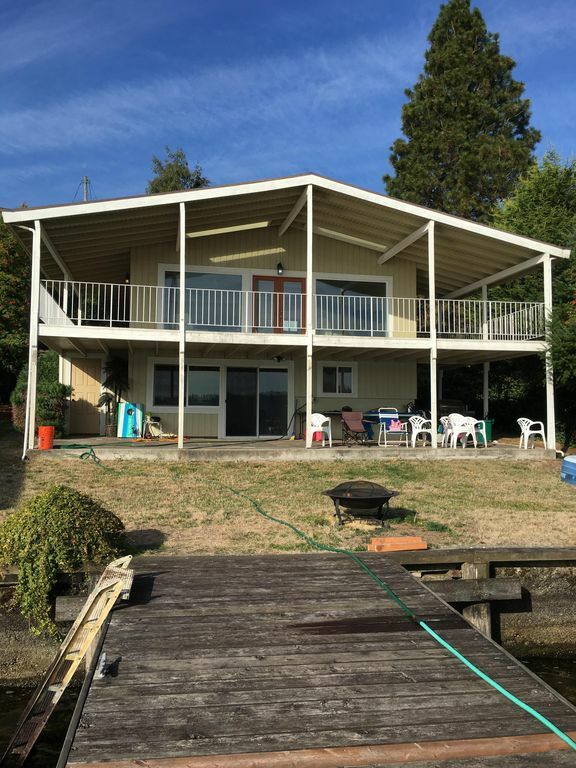 It is huge, has comfy furniture, and great views of the lake! We were happy with kitchen, living room and deck with a view. The bathroom tub was cligged( owner wasn’t aware) so we were concerned if had even been cleaned. Plumbers took nearly 5 hours to fix it and we were hesitant to leave them after finding them smoking and fishing off the dock. The 2nd bedroom isn’t fit for anyone 5 years or older. The bed is so small. 2nd bathroom is unfinished and my kids would not use it. The 50 stairs down to the home really should be mentioned in the ad Incase someone is disabled. Also it’s hard to find because the house sits down on the water... there really should be an address sign with # in the The lot for parking. Great location, beautiful view, very gracious host. Loved having coffee on the dock. Highly recommend for a family or romantic get away.